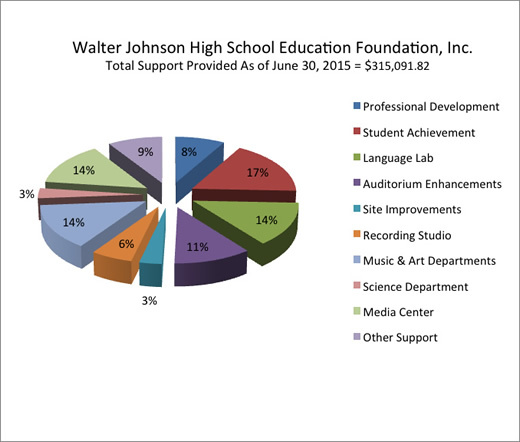 As of June 30, 2015, the WJ Education Foundation passed the $315,000 mark in providing support for Walter Johnson High School. In addition to funds already applied, the Foundation is currently reviewing additional grants for science equipment and professional development, support for expanding academic programs, and equipment for the auditorium. All of this has been made possible by the generous and continuing support of the WJ community. 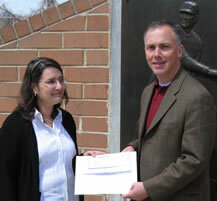 Marney Jacobs, president of the WJHS Education Foundation, presents Dr. Garran with a $20,000 check for the school to use towards the new Language Lab. WJ thanks all of the parents who have generously supported the foundation.